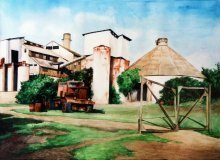 Artwork Dimensions (unframed): 18" x 29"
This painting of Lihue Mill was conceived and begun in 2011 from reference photographs taken in 2003. Since that first visit in 2003, I explored and photographed this mill many times in the morning and evening, in bright sunshine and under threatening skies, captivated with its changing appearance as it continued to decay and finally became a priority project for demolition. 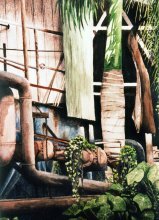 In 2014, after the main buildings and smokestack were taken down and the usable equipment shipped to a sugarcane processor in the Phillipines, the mill had become a part of history and I made a commitment to finish the painting. The painting begun in 2011 had a detailed architectural sketch and the first wash of color completed. The majority of the painting was completed in January and February of 2014. "History" is included in the Art in Public Places collection of the Hawaii State Foundation on Culture and the Arts.